Follow these steps to block specific email addresses. Click on the Gear Icon in the margin. Click on Spam in the margin as shown on the screenshot below. Standard is the highest level of filtering. Selecting Quarantine is recommended, so legitimate email can be recovered from the Spam folder. 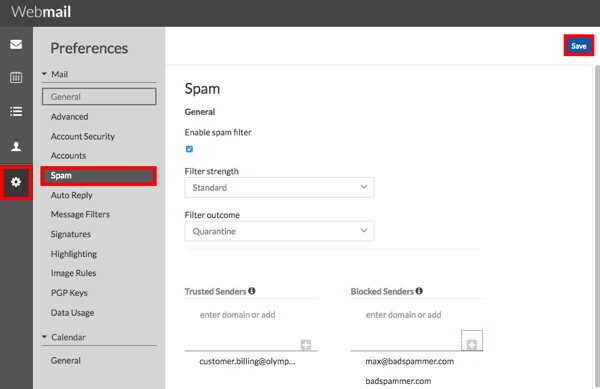 To block email from reaching you, enter the email address to be blocked under the Blocked Senders category, and click the plus sign. Using the format *@example.com would block all senders from the domain example.com from reaching you. Legitimate email addresses that have gone to the Spam folder should be entered in the Trusted Senders list, then click the +. To add an entire domain to your Whitelist, follow the protocol of format in this example: *@example.com to whitelist all email from the example.com domain. Click Save in the upper right after any changes. Check the checkbox beside the Spam in the inbox. Click the (-) Icon above and select Flag and send to Spam. 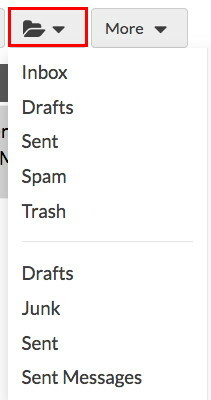 Click the Garbage Can Icon to simply delete email. Click the Folder Icon and click on the folder to which you want to move the selected email.